Most of the online platforms to sell art only have a basic model for artist to make money. Sell art; make money. But wait, did you know, there are other ways for artists to make money too? Enter Showflipper, an online platform that's for artists, and by artists. Here, there are non just one or two ways for artists to make money. As an artist, you can make money by 3 different ways. Let us get to know them. This is the most common way for artists to make money, and everyone know about this way. ShowFlipper provides emerging and amateur artists a platform to showcase and sell artwork online to art lovers, art collectors, art buyers, artists, art curators, art dealers and art affiliates from around the world. Direct selling of their artwork. Easy linking of social media accounts and other web properties. Reach out to fellow artists on the website. Easy sharing and linking of the profile through online, mobile channels. Chat function to interact with art buyers and clients. A dedicated and LIVE wallet system to check earnings through various earning models in real time. A unique model which allows artists to make money on unique views and affiliate selling. The selling account helps to retain 90% of actual art sales earnings while ShowFlipper keeps only 10% as platform fees. The selling account is well equipped to help artists to jumpstart their artistic careers by giving less than 30 minutes per day. This helps artists focus on what they do best, create art! 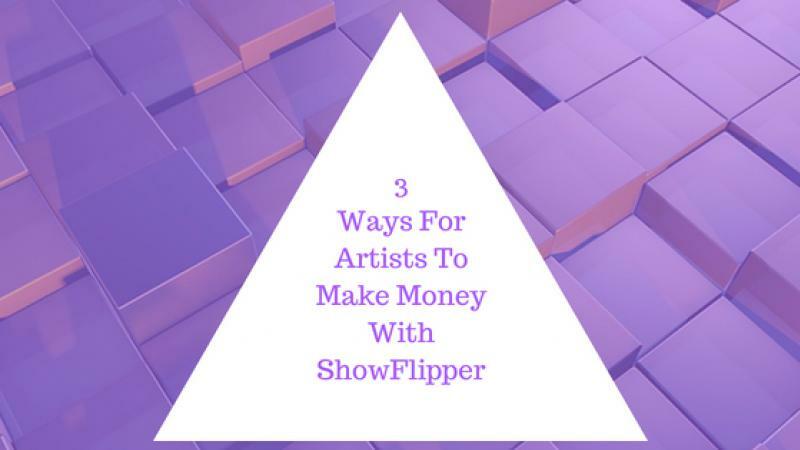 Another way artists can make money online through ShowFlipper is through Showflipper's unique TRP Model. TRP stands for Talent Rating Points, which calculates the popularity of creations in terms of how many unique views your profile get within a particular time frame does. The more unique views a creator profile gets, the higher is the TRP. Here is how it works. Views: Number of views gathered on your profile in any given frame of time. Shares: Number of shares on your profile in any given frame of time. Likes and Reactions: Number of likes and reactions on your profile in any given frame of time. Comments: Number of comments on your profile in any given frame of time. Based on the average of all four, a number shall be assigned which will tell how popular a particular profile is. Only unique or fresh views, shares, likes and reactions, and comments would be considered while calculating. Suppose one of your paintings gets the following views, shares, likes and reactions, and comments. For every unique view on your profile, ShowFlipper will pay you 0.003 USD. Hence, even if an artist is unable to sell an artwork, he/she can still earn money based on the unique views, reactions, shares, and comments. Artists can check out his TRP earnings LIVE from anywhere and anytime in his account wallet. The minimum payout for TRP is 25 USD. The TRP Model also helps a creator in the SF Mega Contest. The SF Mega Contest is yet another way for artists to make money online. As a premium account holder of ShowFlipper, all creators automatically become eligible to participate in this prestigious international multi-category contest where creators from 53 countries participate. It is a mega art contest. There are three prizes for which artists have to showcase their artistry to art buyers from around the world. The contest is a gateway for creators to put their artwork in front of serious buyers from around the world. Are you an artist looking for multiple ways to make money online? Showflipper is here to solve real-time problems for artists around the world. Sign up here to sell your artwork online on Showflipper and make money.